You’re not going to win the “marketing lottery” with a campaign that generates hockey-stick growth. You will probably never go “viral” or be a YouTube sensation. The days of global vitality is largely over, as channels are becoming more fragmented and niche, while simultaneously disappearing. For a B2C company, you don’t want to go viral anyway – you want bursts of growth that gives you momentum and vitality does not. For a B2B company, your target market is not big enough – and that’s a good thing. But you can, actually, achieve “hockey-stick” growth. However, that’s only possible if you lay the groundwork with specific strategies, models, and team structure. If your models, strategies, processes, campaigns, and team aren’t built for growth, you won’t see it. 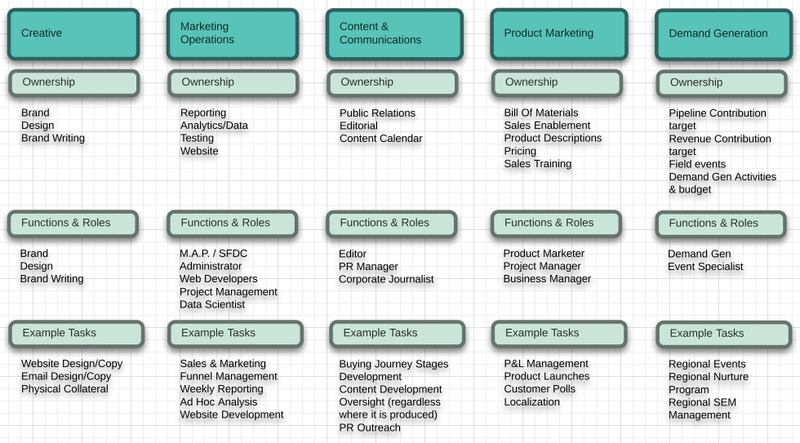 In the last article I talked about preparing your marketing team for growth by starting to think and strategies about team structure, systems, and process. Marketing, an online marketing in particular, has changed dramatically in just the past 3 years, and it continues to morph and adjust. You can actually apply a modified version of Moore’s Law to marketing. Requirements have shifted, from the focus of big national campaigns with award-winning creative (there’s still a time and place for that) towards blending creative, data and analytics focused, experimentation, and models and team structures that are agile, “lean”, but still impactful. Your marketing should still deal with owned, earned, and paid media; sales and marketing alignment against pipeline and revenue; go-to marketing programs and partnerships, and so on. But you absolutely need to make some adjustments to how you’ve used to do things. Every business faces constraints of different kinds, and most marketing teams and leaders tend to assume their major constraint is resources. But actually, your constraint is process. You’ve likely seen and read all about “the lean startup” and being “agile”. It’s a great model for startups to find Product/Market Fit, which in itself is obviously crucial (without it, you have no business). But can you copy the “lean” model into a process of agility for marketing teams? Smart people think you can, and have done so: enter the term “growth hacker”. The process of “hacking” growth can also, in turn, be translated into a process for developing, deploying, and optimizing your marketing campaigns. This process-focused way of working means you have to adjust your team structure. You have to fundamentally shift your focus, from resource-oriented to process-oriented. And in turn, you’ll build a stronger, agile, and effective team. When you’re a team of one or a few, needing to go from 0 to Traction, your processes look one way. When you’re a team of a few, wanting to go from Traction to Scale, your processes look different. (Thanks and credit to Jascha Kaykas-Wolff (Mozilla CMO) for the slide in his presentation). This is the table that need to change, and specifically towards growth processes and models. I’ve made marks on the areas to start with. A simple shift of focus can open up new resources or a new way of using resources that were previously hidden from you. If the priority and goal of your marketing is growth, you need to align your resources with that. To broad categories of Creative, Marketing Operations, Content & Communication, Product Marketing, and Demand Generation can remain as categories, but if you’re trying to achieve Traction or go from Traction to Scale, your campaigns only job is to make that happen. So, for either a B2B or B2C company, you should prioritize Demand Generation. Now, other types of companies can pick this up too, but talking more specifically about B2B SaaS and software companies, funneling sales opportunities to your inside sales team is the prime concern. If you’re a Startup looking for Traction, or a business looking for Growth, this absolutely applies to you. You blend inbound and outbound to develop campaigns that attracts, captures, nurtures, and feed MQLs to your inside sales team. The model just about everyone has adopted so far is the “Predictable Revenue” strategy, by Aaron Ross. But that’s from 2004, and B2B lead generation has moved on and changed. Still, it’s a valuable and useful place to start, and I’d tell anyone to start there. However, if the focus is on growth and process, you still need agility in execution and team. Because if cold emailing prospects with an aggressive cadence worked 6 months ago (and it did), it doesn’t work quite the same now (it doesn’t). The capabilities to change, modify, adjust, tweak, and generate new campaigns and ideas is imperative for your demand generation to ever show results. You need to develop a process that helps your team develop and deploy growth campaigns, retain their knowledge for future posterity, and the capabilities to quickly make changes. I’m going to talk more about this in a different article but for now, let’s look at your marketing team. The only true answer is: it depends. If you’re in the “Zero (or seed funding) but need Traction” phase, you need a dedicated team. If you’re in the “Traction but want to Scale” phase, you usually need a dedicated team but depending on revenue and/or funding, you could set aside a dedicated “growth special team”. If you’re in the “Relatively Established but want to 10x our Growth” phase, then you need a dedicated growth team-within-your-team. If your marketing team is less than 5 people, you make a change to the whole team. You need to treat your team as a dedicated growth team. 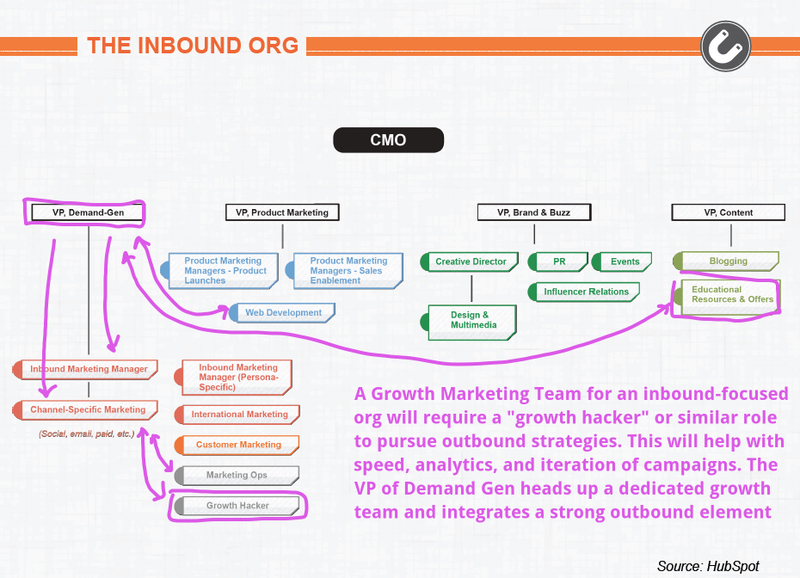 If your marketing team is more than 5 people, you start with a small dedicated growth team. You’re then free to keep it a special team, or roll out changes to the rest of the team later. Your mileage will vary, but this is a great place to start – it’s always best to move ahead and modulate direction as you go. Let’s take a look at some actual, real-life marketing teams and how they could implement and experiment with Growth Marketing. You and I are indebted to Jascha Kaykas-Wolff (Mozilla CMO), who’s presentation sparked Mike Volpe of Hubspot to compile another slide presentation with a collection of existing marketing teams. My work as a Growth Marketing Coach or Consultant involves looking at existing systems, teams, and structures and finding potential for empowering executing on growth campaigns. The teams I’ve worked with so far are brilliant and experts at what they do. It’s a privilege to meet and work alongside such talented people and teams. Below, you’ll find a brief discussion on a few, select marketing team structures that lend themselves to adopting a “growth mindset”. Normally, I mostly work with clients who are looking for Traction or Growth (tend to be startups and companies in the 6-figure range who want to scale), and these examples are of large marketing organizations – but it still applies to you and your company. You need to understand where Growth Marketing fits in, and how to structure your systems, processes, and team around a growth process and mindset. You might be a team of 1 or a handful of people, but the roles and capabilities for growth are largely the same. Where Does A “Growth Team” and “Growth Process” Fit In? The strength of this team is the ability to adapt, evolve, and stay agile. In general, collaboration between the specific members I’ve noted above will be instrumental in pursuing growth. 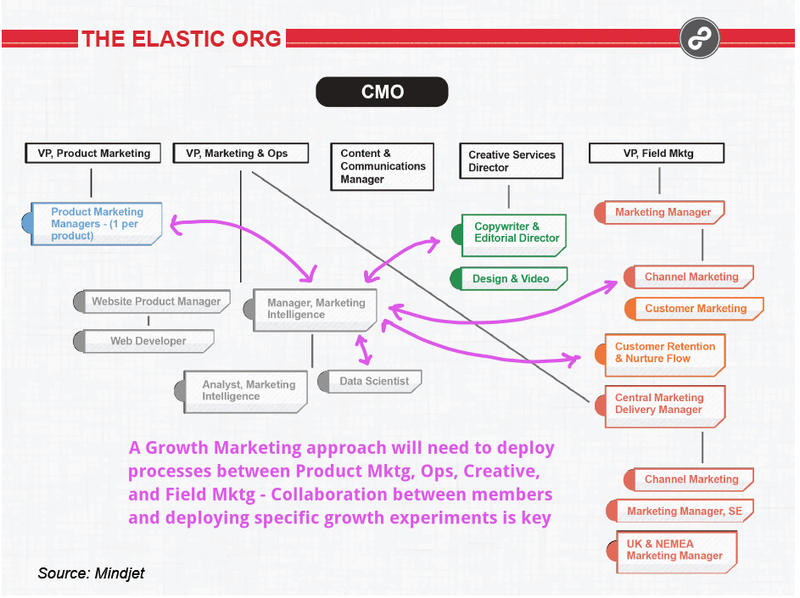 If one was to set aside a dedicated Growth Team with a structure like this, it would involve the Product Marketing Managers (PMM) being team lead, while a small core of 4 members (creative, channel, analytics/data, and developer) could be given the challenge, resources, and budget to pursue experiments. Of course, it’s never about throwing stuff against a wall to see what sticks – any experiments are rooted in a scientific approach and staying on brand. The challenge for an inbound-centric marketing team is figuring out where, and how, to implement specific outbound growth strategies. Mike Volpe has formed a team that focuses on the inbound experience and it’s working – they recently hit 15,000 HubSpot partners. Because they’ve already built up such a momentum and existing deal-flow, pursuing growth with a dedicated team would be to expand market share by seeking dominance in various channels. Also, if you have a dedicated Growth Team, HubSpot could utilize those capabilities for growing new products, like Sidekick. Testing for go-to-market strategies could be a good goal to pursue. HubSpot also finds itself well beyond the intitial Startup and Traction phase, and is in the Established phase. Where a Growth Team can fit in, more specifically, depends on what their goals are for the next stage of their company. 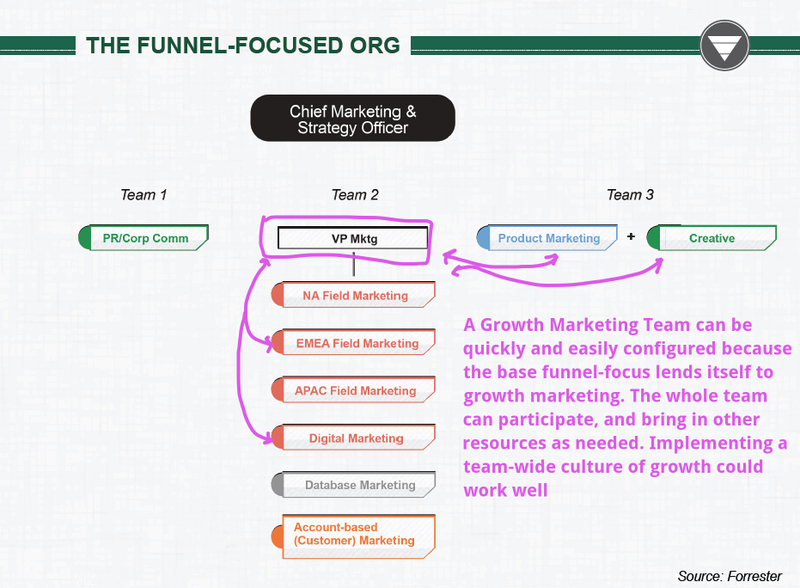 Because of the funnel-focus already existing, you don’t necessarily need a dedicated team. Making room for growth experiments, and having the teams collaborate, could unlock potential in the organization that might otherwise be under-utilized. Team lead would be the VP of Marketing, and not every team member need to be involved on all experiments, and because of that, it’s important to track, measure, and collect knowledge that everyone has access to. It would probably be a good idea to have review meetings where everyone discusses growth campaigns and their results. For an organization like this, infusing a “growth mindset” across all teams would yield more than setting aside a dedicated team. Of course, these structures are for companies that have mostly gone past the Growth phase, and are fairly established. But if you’re a Startup, or company in the Traction or Growth phase, you have an advantage if you switch towards a growth-centric model for your processes, campaigns, and team now. In fact, I would argue that you stand little-to-no chance of sustainable growth unless you do. Your team might consist of 1, or a handful of people. But models and frameworks like these can yield disproportionate and exponential results for your growth.